Fair Trade Wood Djembe Drum, "Think Together"
Daniel Asante carves an extraordinary djembe drum from tweneboa wood. He depicts solemn faces in high relief that gaze thoughtfully from the base. Illustrating a wise saying, its name Tikoro Nkoagyina is an Akan word meaning "two heads are better than one." 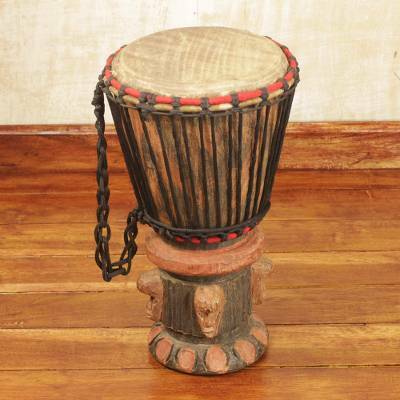 The djembe originated in Benin, where it is used during voodoo rites, and has been introduced into neighboring countries. It is indispensable in contemporary reggae. The goatskin head is affixed by iron rings wrapped in cotton, and a macramé cord can be slung over the shoulder. You can find wood djembe drum 'Think Together' by Daniel Asante in musical instruments categories such as Djembe Drums and Wood Drums. Enjoy exploring these sections for other Novica treasures. Daniel has two grandchildren in elementary school that he supports. Daniel Asante has received 9 microcredit loans with 0% interest from Kiva and Novica, the first for $300 and the most recent for $600. Proceeds were used to invest in the purchase of wood, goatskin, polish, and sandpaper for production. "I love to create new designs, so I constantly work to diversify my collection of masks and profiles." "I was born on April 22, 1969. I learned how to carve from a brother in-law Samuel in 1998 at Aburi, before then I learned carpentry in 1989 in Accra. I use sese and tweneboa woods for all my products. I specialize in the making of mask and drums. There is high demand for my products, but due to financial constraints I'm not able to produce more work to meet the demand. "People come for my products for exhibitions and, when a contract is won, they bring it to me to produce. I get a commission on the amount paid, but I'm happy to work with Novica because I won't be cheated again. "I have taught more than ten people how to carve and they are also well-established in this trade. "I love to create new designs, so I constantly work to diversify my collection of masks and profiles. "I'm married and I have four children but, I also look after five other children." This is my second piece of art from Mr. Asante I just received my mask ""Believe in Oneself"" and I must say it is absolutely gorgeous. Mr. Asante is truly a talented artist and I am sure I will purchasing many more pieces of his work. I absolutely love Mr. Asante Wood Lazy Chair ""Jungle Giraffe"" it is a true piece of art. The carvings are so detailed and absolutely beautiful, it looks truly amazing. This piece of work will truly impress and inspire you. If you’re considering a purchase take my advice don’t hesitate you will be well pleased.